I love horror movies, but surgery gives me the heebie-jeebies - hearing about surgery, seeing operations on TV . . . even just thinking about it. Yet I cannot pull myself away from the new podcast Dr. Death, released this September, even though it's full of graphic details about botched spinal surgeries. The six-episode podcast, which is best classified as true crime or medical horror, tells the story of Dr. Christopher Duntsch, a Texas neurosurgeon whose 18-month surgery spree left dozens of patients dead, paralyzed, or in agonizing pain. Fans of the riveting Dirty John podcast will quickly discover similarities: the subject of the series is a seemingly charming doctor who arouses suspicion at every turn, except Dr. Duntsch's outcomes are even more disturbing and tragic. The first four episodes (each about 45 minutes long) are now available on iTunes and other podcast platforms. 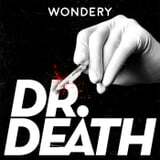 Listening to the Dr. Death podcast will devastate you - not only because of the gory details, but also because of the tragic outcomes and the disturbing ways in which the healthcare system failed to protect patients from a negligent surgeon. Each episode features heartbreaking interviews with former patients, doctors, and people close to Duntsch. This podcast is dark, to say the least, but also incredibly well-reported and important to hear. Reported and hosted by veteran healthcare journalist Laura Beil, Dr. Death establishes right up front what the story is about: Dr. Duntsch wooed patients with his credentials but utterly failed to uphold the "first, do no harm" principle of the Hippocratic oath with 33 patients, including one of his oldest friends. The doctor's backstory unfolds with each episode, leaving viewers unsure about how this catastrophe could have happened. Was Dr. Duntsch an impostor or simply incompetent? Did he have a drug problem that led to his negligence or was he a cold-blooded killer? By episode four, I suspect it might be all of the above. It's chilling. So, this podcast is not for the faint of heart - or maybe it is, because despite the fact that hearing about surgery makes me feel lightheaded, I can't stop listening to it.